Cliffe FC Sunday progress to the next round of the East Riding County Cup with a 5-3 win over Duke FC. Saturday was a day to forget for the First Team at Old Malton in FA Cup, whilst the Reserves lost on penalties in same competition. 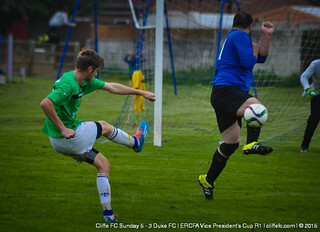 Cliffe FC Sunday are through to the next round of the County Cup with a confident performance against Duke FC, the away side scoring three goals in the last 15 minutes but Cliffe doing enough to win 5-3. The opening 20-or-so minutes were goalless until Nathan Parker opened scoring with a right-footed effort 1-0, Parker doubled his tally with a powerful header before the half-time break, 2-0 – Parker’s forth in two matches for Cliffe Sundays. Man-Of-The-Match, Aidy Wood came close but his shot hit the angle of post and bar, 2-0 HT. Cliffe needed to kill-off the tie and with the scoreline at 2-0, a Duke goal would see them back into the tie that Cliffe were in control of. A Ryan Tiplady goal from a Cliffe corner saw the home side go 3-0 ahead and the goal of the game saw Tom Collins hit a long-range left-footed drive that flew past the ‘keeper and in off the underside of the bar, 4-0. Cliffe having looked to have sealed their place into the next round, saw Duke grab a goal back for 4-1, but Tom Hogg scored to restore Cliffe’s comfortable cushion at 5-1. Comfortable nearly turned to “squeaky-bum-time” when Duke first made it 5-2, and then 5-3 with a couple minutes plus injury time remaining – Cliffe clearly having taken their foot off the peddle – but the referee blew the final whistle and Cliffe won 5-3, FT.
Next week Cliffe FC Sunday remain in cup competition as they begin their York FA Cup campaign, Dunnington the visitors at Oxen Lane. Cliffe FC Reserves are knocked out of the York FA Cup, Harrison Signs Reserves winning on penalties with the scoreline reading 1-1 after 90 minutes. Harrison Signs Reserves, who reside two divisions above Cliffe, took a 1-0 lead. Ryan Tiplady levelled before the half-time break – a James Gallgher throw-in controlled by Dan Richardson and played into the path of Tiplady that hit a 20-yard shot that took a slight deflection before hitting the back of the net, 1-1 at the half-time break. Neither side were able to get a winner, but Harrison Signs had the best chance having won a penalty eight-minutes before the end of normal-time but Ally Harris made a strong save that sent the tie to a full penalty shoot-out. Cliffe missed two penalties in the shootout and Harrison Signs won 4-2 on penalties to progress into the next round. Cliffe FC Reserves aren’t back in action until 10th October when they make the trip to Skirlaugh Reserves in County Cup action. 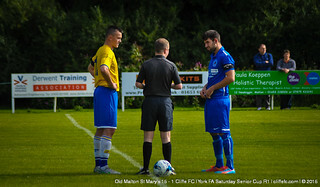 A day to forget for Cliffe FC, Old Malton handing out a record defeat in a 15-1 cup thrashing to a depleted Cliffe side. Old Malton took the lead in the opening minutes and never looked back, Cliffe’s only goal coming from Luigi Foschi that drew Cliffe level at 1-1 – the assist coming from Tom Hogg – and Dave Laverack saved a penalty at 3-1, but the Old Malton pressure rarely let-up which saw the home side lead 5-1 at the half-time break. The Premier-Division heavyweights didn’t let up in the second-half either and scored a further ten-goals as Cliffe collapsed, 15-1 the final score and Old Malton progress to the next round. Much work to do for Cliffe FC as they look to recover from this humbling defeat, next week they travel to Riccall United Reserves in County Cup competition, where a positive response is hoped for.